THIRTY-DAY FIANCÉ by Leanne Banks, New York Times and USA Today bestselling author: Bombarded with unwanted attention when he is proclaimed the Bachelor of the Year, Nick Nolan asks his childhood friend to be his temporary, pretend fiancée. But what happens when a safe arrangement turns passionate: can Nick and Olivia break their 30-day deal in a trade for forever? 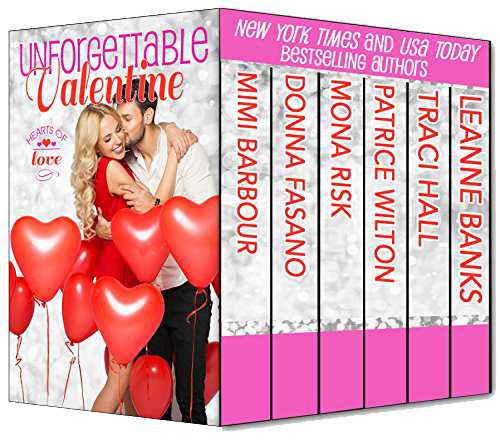 Also includes SECOND CHANCE VALENTINE by Donna Fasano, WEDDING SURPRISE by Mona Risk, HOTSHOT COWBOY by Mimi Barbour, BLOSSOMS BY THE SEA by Traci Hall, and CHAMPAGNE FOR TWO by Patrice Wilton.